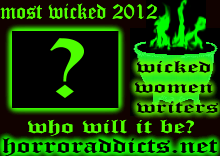 Who Will be 2012’s Most Wicked Woman Writer? Click here to listen to the 2012 Wicked Women Writers contest ~ You’ll need to scroll down past the WWW graphic to find the player for the podcast, because it is below the fold. Each of our WWW was assigned a holiday, a location and an object to include in her tale of horror. Voting starts August 11 and ends September 13. 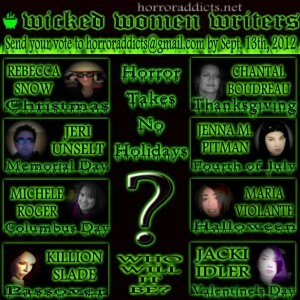 To listen to the stories, go to http://horroraddicts.wordpress.com/2012/08/11/horror-addicts-079-wicked-women-writers-challenge/ . To vote for Killion Slade for the podcast story “Children of Angels” ~ Click Here: Horror Addicts 2012 WWW Podcast Contest Put “Vote for Children of Angels by Killion Slade” in the subject line. One lucky voter will win a prize! 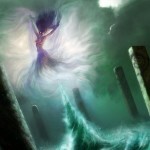 Click here to listen to the 2012 Wicked Women Writers Podcasts. You’ll have to scroll down past the graphic , on their website, to find the player, because it’s below the fold. Put “Vote” Children of Angels by Killion Slade. Each of our WWW was assigned a holiday, a location and an object to include in her tale of horror. Voting starts August 11 and ends September 13. To listen to the stories, go to http://horroraddicts.wordpress.com/2012/08/11/horror-addicts-079-wicked-women-writers-challenge/after August 10, 2012. To vote, email horroraddicts@gmail.com. Put “vote” in the subject line. One lucky voter will win a prize.